It is a wedding season in telly town. 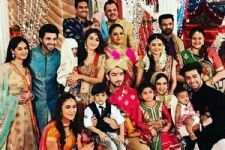 Wedding bells are not ready to stop ringing as our telly town stars are joining the married club one after the other. 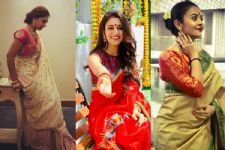 After Sheena Bajaj-Rohit Purohit, Benaf Dadachandji, Surbhi Tiwari, Abhishek Sharma, Palak Jain, another actress has taken the step to join the married couples' bandwagon. And she is none other than the Saath Nibhaana Saathiya actress Lovey Sasan. The actress who became a household name for her stint of Paridhi on the Star Plus show took the marriage vows yesterday with fiancee Koushik Krishnamurthy in a traditional Sikh wedding in Amritsar, Punjab. The wedding happened in a gurudwara in the presence of close friends and family. The bride looked royal and regal in a blush pink lehenga with emerald and kundan jewellery. On the other hand, her South Indian beau also looked dapper in a sherwani and turban. The duo got engaged last year in March. Reports were rife that the duo was heading for a destination wedding in Italy but that could not materialise as her grandparents did not have a passport. For the ones who don't know, Lovey met Koushik on a Whatsapp group for singles, who are looking for prospective partners. And they connected instantly. #Revealed : Colors Shrimad Bhagvad's LAUNCH DATE is here!